Cage Warriors 75 takes place on April 15, 2014 at Camden Centre in London, England. 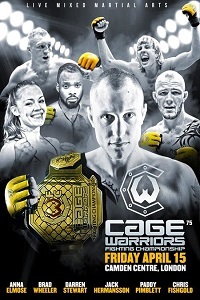 Click the stars to rate how good you think Cage Warriors 75 was. • Ashleigh Grimshaw vs. Paddy Pimblett: Paddy Pimblett def. Ashleigh Grimshaw via unanimous decision (30-27, 30-27, 30-27). • Scott Clist vs. Brad Wheeler: Scott Clist def. Brad Wheeler via TKO (strikes) at 5:00 of Round 1. • James Hurrell vs. Darren Stewart: Darren Stewart def. James Hurrell via TKO (punches) at 0:37 of Round 1. • Alfie Davis vs. Terry Doyle: Alfie Davis def. Terry Doyle via TKO (punches) at 2:41 of Round 2. • Chris Fishgold vs. Jordan Miller: Chris Fishgold def. Jordan Miller via submission (guillotine choke) at 1:04 of Round 1. • Pelu Adetola vs. Gyorgy Dolog: Gyorgy Dolog def. Pelu Adetola via unanimous decision (30-27, 30-27, 29-28). • Oliver Battell vs. Rob Scott: Oliver Battell def. Rob Scott via TKO (punches) at 0:37 of Round 1.